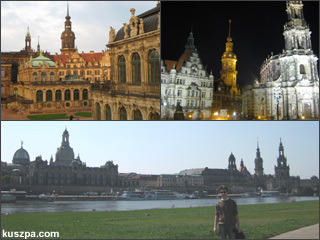 Dresden by panormaview, by day and by night. The day before the Mobile BarCamp I had the chance to enjoy a small sight-seeing tour in Dresden. For the beginning I was inside the Dresden Frauenkirche – this church has been completely reconstructed after the war and today you had a lovely view from the viewing platform. There are also other pompous churches in Dresden like the Catholic Court Church (Hofkirche) and the Russian Orthodox Church. I also had a look at the Saxon State Opera (Semperoper), the Zwinger Palace (Der Dresdner Zwinger) and big wall painting with the Saxon sovereigns (The Fürstenzug).